Thanks for stopping by! I hope that you found this information helpful. As with most things, (and pest control is no exception) prevention is the best option when possible! For more pest control info, this handy book by Dr Bader is full of helpful tips. Are flies starting to bother you? Trying to find a way to get rid of them? Flies can be a huge nuicense and it is very common for their numbers to increase to the point where a simple fly swatter and killing them one by one is just not an option any longer. So what do you do when this happens? You have to find a way to get rid of large numbers of them all at once! Did you know that flies have been known to cause more death than any other insect? I was very surprised when I first heard that statement, but after learning more about them, I can see why it is true. Flies feed and lay their eggs in any kind of organic waste. (Human and Animal Feces) They fly around and land on the waste material, and then they land on your plate of food, and BANG! Now your have all of the germs and diseases that were on the organic material right there on your plate of food. You unknowingly eat the food, and the germs and diseases go right into your body. Adults lay about 100 eggs every few days on organic matter. 10 hours after being laid, the eggs hatch into maggots. The maggots immediately begin to eat the organic matter, and do this for about a week. A cocoon is made of outer skin of the maggot an inside the cocoon, the maggot transforms into an adult. Adults usually live a few months. As you can see, large amounts of flies breed in a very short time, so controlling their numbers can be an ongoing process. In areas of your home, you can decrease the numbers by making sure that excess garbage is not sitting around. Usually hanging a few fly strips can take care of the ones inside your house pretty quickly. (you know, the sticky ones that hang from the ceiling???) You can also spray some fly killer around every once in a while. In areas where manure is always going to be present (farms, etc) and animals are as well, you will not want to use chemicals in excess. So what can you use? Flies can really become a nuicense to farm animals, and the animals home (barn) is a perfect location for heavy breading of these insects. Pesticides are not ideal to spray in a barn, so the best option for this kind of location, would be an electric fly killer. 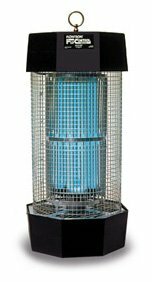 Electric fly killers come in different sizes to handle different amounts of coverage area. You can buy them for outside your home if you have a small area that you would like coverage for, and you can also find larger, more powerful units for larger areas such as in barns. Keep in mind however, that these electric units will kill more than just flies. They will also kill any insect that makes its way to it. Sometimes, however, these units are the only thing that will take care of an out of control population. Any amount of flies can quickly become a problem, and although they appear harmless, they really aren't. Monitor their numbers and if and when they seem to become to overpopulated, or just plain irritating, their numbers can effectively be controlled through sprays, strips, and even electric killers. These fly strips work wonderfully inside your home. The ones pictured here come in a pack of 8. This electric killer is great for outside use around homes. It has a 1/2 acre of coverage area. This electric killer is for outdoor or indoor use. 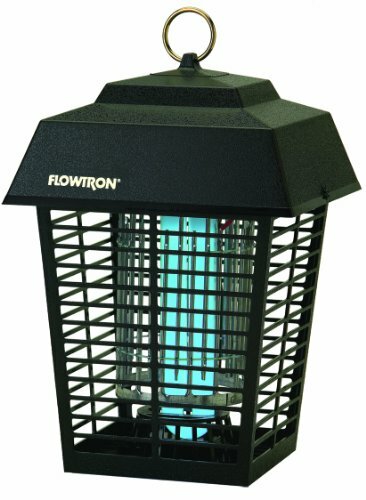 It will attract and kill flies up to 2 acres during outside use and up to 1200 sq ft of indoor use. This would be perfect for using in barns and other outdoor/indoor areas. In my opinion fruit flies are much more of a headache to deal with, any advice on getting rid of fruit flies?